Surface mounted strike for Rim Panic Devices. 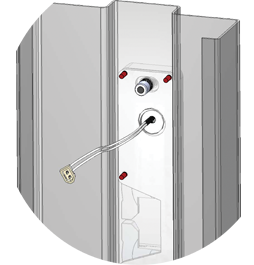 This low current draw strike is perfect for every day access control system and automatic door installations. The lower current draw allows for a smaller power supply, or allows use of an operator, which saves you money. .135 Amps @ 24DC uses 3.24 Watts. Reduce the number of installations that need a separate power supply for door hardware or add more devices to your system. Increase UPS up time due to lower current draw. 1/2� thick Surface Mount that comes with a 1/4� and a 1/8� Spacer -- this provides the flexibility of up to 4 different sizes! No cutting of the frame. 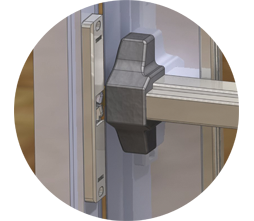 We supply an 1/8" thick spacer plate for those installations that require mounting the strike closer to the panic bar. In addition, the spacer plates can be used as a template during installation. This is especially helpful when installing Trines patented anchoring system. You can order an additional 1/4" Spacer plate with part # 4850-SS or 1/8" Spacer plate with part number 4800-SS. Note that 4850 Strike comes with both a 1/8" and a 1/4" plate already.